Happy Halloween! This has nothing to do with Halloween. In 1977, in response to a fortuitous alignment of the outer planets of our solar system, NASA launched space probes Voyager 1 and 2 to tour the outer planets and transmit photographs back to Earth. In that capacity the Voyagers were spectacularly successful, sending tens of thousands of images of planets and moons back to Earth via radio. Both probes passed beyond the orbit of Pluto in the late 1980s, and they continue on toward interstellar space traveling at approximately 37,000 mph (almost 60,000 kph). They continue to transmit data back to Earth, and are expected to do so until around 2025, when their radioisotope thermoelectric generators will be exhausted, and unable to power any instruments. In 40,000 years or so, Voyager 1 will pass within 1.6 light-years of the star Gliese 445, and at around the same time Voyager 2 will be within 1.7 light-years of the star Ross 248. If either of these systems happen to be home to an advanced alien civilization, there’s a chance they will detect and retrieve one of our plucky nuclear space robots. 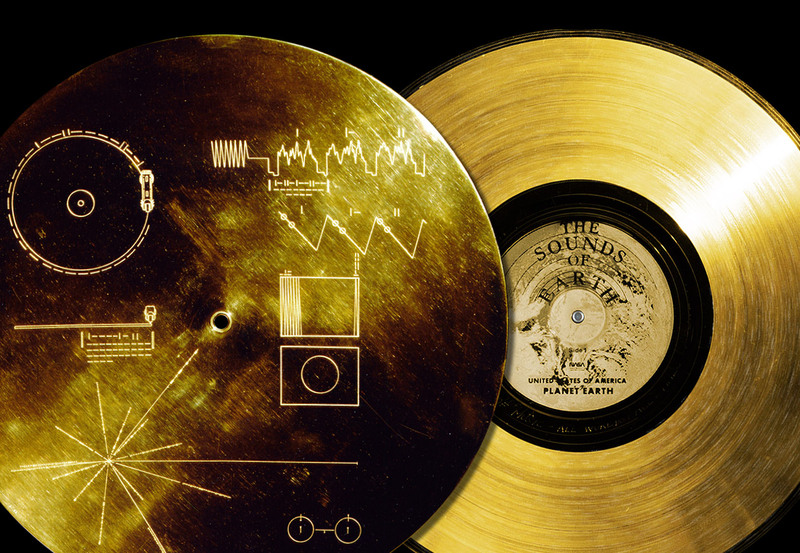 In anticipation of the possibility of such proxy contact, NASA mission designers affixed a message from humanity to the side of each probe in the form of a phonograph record. These gold-plated copper records each contain an identical compilation of sounds and music from all over the Earth, as well as analog-encoded images. In the event that one of the probes is ever discovered by an intelligent alien species, the included instructions will hopefully allow them to decode the sounds and sights of our civilization. We at Damn Interesting have put together an online simulation of what an alien civilization might see and hear upon decoding one of the records, assuming that their seeing and hearing abilities are similar to our own. For the best experience, a laptop or desktop screen size is recommended. We share these sounds and images under the “fair use” exception to copyright law due to the historical significance of the media. You can launch the interactive now, or read on for more background and technical detail. The eclectic contents of the golden records were curated by a committee chaired by Dr. Carl Sagan. The records were designed to be played at 16.67 rpm—half the usual speed of a typical phonograph record—trading audio fidelity for extended length. For the approximately two hours of sounds, the committee selected vocal greetings in 55 Earth languages; sounds such as thunder and machinery; and music from around the world. Unfortunately, Sagan’s committee failed to credit many of indigenous performers whose music was featured on the record, instead crediting the anthropologists and musicologists who recorded the songs. As much as possible we have attempted to properly credit the artists in our interactive, but there are still some we have been unable to identify. The records also include the song of the humpback whale, and an hour’s worth of brainwaves recorded from Sagan’s fiancée Ann Druyan, sped up to condense them into ten seconds of audio. The images on the record are analog-encoded, each composed of 512 lines. The first image is a “calibration circle,” intended to verify to the decoders that they have succeeded in translating the analog data into an image. Following this are 121 images featuring mathematical definitions; diagrams and photos of our solar system; human anatomy; scenes from Earth; and written messages from humans associated with the project. Some of these photos are in color, using an image of the solar spectrum to provide a 12-bit color key, permitting a total of 4,096 colors. Each record is enclosed in a protective, gold-plated aluminum jacket, together with a cartridge and a needle. Symbols etched into the protective cover attempt to convey where the spacecraft came from, and and how to decode the contents of the record. This cover also contains an ultra-pure source of Uranium-238 that an alien civilization could use as a radioactive clock to deduce the age of the craft, by measuring the remaining Uranium-238 and calculating based on its half-life. Sagan and his team chronicled the effort to design the golden records in the 1978 book Murmurs of Earth. A later edition included two CD-ROM discs reproducing the contents of the golden records. Unfortunately the book and CDs have been out of print for years. Written by Alan Bellows, copyright © 31 October 2016. Alan is the founder/designer/head writer/managing editor of Damn Interesting. Special thanks to Michael Terry for help acquiring some of the audio and images, and to Dr. Alice Gorman and Anthony Michael Morena for bringing the identities of some of the previously uncredited artists to our attention. Last updated 28 November 2016. Thank you for this! As usual, your presentation is fantastic. I’ve always wanted something exactly like this: a simple yet complete presentation of the record and cover plate. Now, I’d like to request more footnotes. Many of these images have fascinating stories behind them. For example, the plaque of continental drift was also attached to the LAGEOS-1 satellite which should be in orbit for another 8.4 million years. Of course there is also tons of science in the drawing and diagrams by Frank Drake who is also known for the Drake Equation and the transmission sent from the Arecibo Telescope in 1974. I agree with Dr. Sagan about the importance of the bottle in the ocean but there is a flaw in the plan. If an alien civilization finds either of our probes, before the 30-40 thousand years from now mark, then chances are they are already aware of us because of the (relatively) close proximity of the Voyager probes to earth. On the other hand if none of those, for now, hypothetical alien civilizations can find the probes before that 40,000 year time frame than chances are that we’ll have made the point moot by either discovering faster than light travel and we will have already met those societies. That or humanity will have suffered a fatal ‘accident’ of some sort and will no longer be around! And in the distant future that record may well be one of the only traces left of our civilization. Top job Alan. I proudly keep the Spanish translated copy of Murmurs of Earth I purchased when I was 12 or 13. Still wonders me after almost 40 years. Kind of scary that we’re sending out to the universe our 70’s fashion & tech. They’re gonna think we’re a lil backwards & have panache for winged collars & sideburns. That is absolutely AMAZING. Not just DamnInteresting, DAMN AMAZING! Damn interesting indeed…How the details are interpreted and reacted by receivers would be interesting, isn’t ?? There was a recent Kickstarter campaign for the 40th anniversary of the Voyager probes. Ah, the voyager discs! The worst joke humanity ever pulled off. A pointless message in 155 different, incohesive languages, spoken by 155 different voices, articulations and accents, with no delimitation between them. If an alien civilization ever tries to decode it’s meaning they’ll find that there is no common rationale in any of it, and they’ll just end up frustrated that we wasted this truly unique chance of communicating on a stream of unintelligible garble. We could’ve given them a Rosetta’s stone, with one side of the disc containing images and the other side simultaneously describing what it is that can be seen in them. And all that in one, well articulated voice and in a language that’s easy to learn, not the incredibly complicated mess of words and sounds that is English. Preferably a less complex language like Malayan which has hardly any conjugations and plurals are simply the singular noun repeated. It would probably be best even have used a made up, easy to learn, basic simple language as 40.000 years from now, there won’t be anyone on Earth who understands any of the languages spoken today. So if the aliens were ever to reply in the same language, we would have to relearn it all anyway. Basically the only thing that can easily be extracted from the information on those discs is Earth’s location, so the aliens will know where to send that fusion bomb when they finally realise we’ve pulled their leg and made them spend lots of valuable resources for absolutely nothing. @Dreeze: Dr Sagan and his team had less than a year to design the cover, gather the audio/images, secure permission from the artists, press these two-of-a-kind records, and secure them to the spacecraft. All this while navigating a vast governmental bureaucracy. A Rosetta-stone-style translator was just out of their practical reach. Besides, the golden records are really more for the benefit of humanity than that of any aliens. They are a gesture of optimism and self-assertion, like many of our monuments here on Earth. I’m not blaming anyone, it’s just that given the oportunity the whole of humanity could’ve done a much better effort. Given the fact that it’s very (extemely) unlikely the discs will ever be found or read, the fact that we tried is pointless unless we make a genuine effort, which we didn’t. Do you there’s secret message if the record is played backwards ? Having said this, do we know if there were any instructions included advising on the direction the record should be played ? Get your matter transporters their whitest with….